A first earthquake of magnitude 7.4 hit Donggala at 18.02 last night. A few minutes later, another 5.9 magnitude earthquake struck Palu, the provincial capital. Waves up to 3 meters high crashed into the coast between 18.22 and 18.36. Communications between agencies and rescue teams are made even more difficult by the widespread lack of electricity. Palu airport closed. 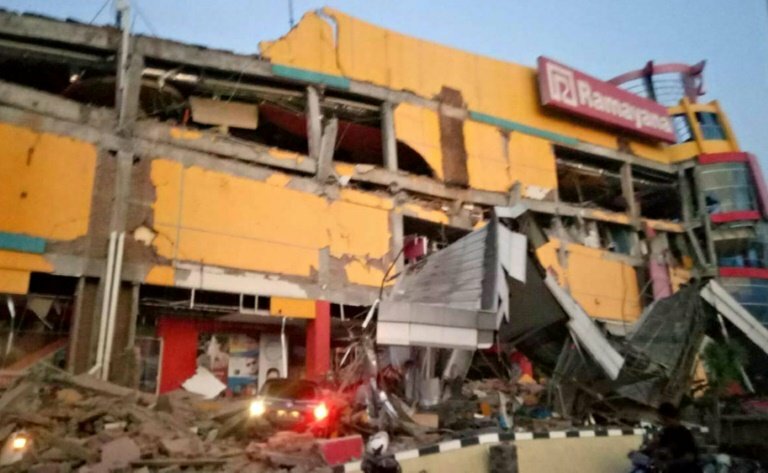 Jakarta (AsiaNews) - A series of strong earthquakes have triggered a tsunami that struck the beaches of Donggala and Palu (Central Sulawesi) last night, causing at least 384 deaths, hundreds of injuries and extensive damage to infrastructure. This is the provisional toll contained in bulletin of the National Agency for Disaster Management (Bnpb). A first earthquake, of magnitude 7.4 with its epicenter 27km away from the city and at a depth of 10km, hit Donggala at 18.02 last night. A few minutes later, another 5.9 magnitude earthquake struck Palu, the provincial capital. Sutopo Purwo Nugroho, a spokesman for the BNPB, reports that the two shocks caused waves up to 3 meters high that between 18.22 and 18.36 devastated Talise Beach (video) and the coast of Donggala. Nugroho states that "many buildings have collapsed" and that "numerous bodies have been found along the coast". The energy infrastructure is out of service since last night. These include four power plants. Gen. Wiranto, Minister for Political, Legal and Security Affairs, is mandated by President Joko "Jokowi" Widodo to coordinate the government's response to the disaster. He claims that Palu airport has reported significant damage and has been closed. Communications between agencies and rescue teams are made even more difficult by the widespread lack of electricity. Muhammad Sadly, of the Indonesian Institute of Meteorology and Geophysics (Bmkg), explains that "the disaster was caused by the telluric movements along the Palu-Koro fault". It is located on the long "line" that connects Lake Palu to the valley of Koro (Central Sulawesi) passing through several cities including Palu City, Poso, Toraja and Lake Bone. Dwikorita Karnawati, director of the BMK, declares that the earthquakes of Donggala and Palu were preceded by tremors that occurred around 2.00 pm Indonesia is located on the Pacific Ring of Fire, where tectonic plates collide and many of the world's volcanic eruptions and earthquakes occur. Earlier this year, a series of powerful earthquakes struck Lombok, killing over 550 people on the island and near Sumbawa. Approximately 1,500 people were injured and around 400,000 were displaced.